Balefire Labs, Inc (http://www.BalefireLabs.com) -- provider of online, preK-12, educational app reviews for teachers and parents-- announced today the winning apps of its second annual Best EdApp awards competition. "We're thrilled to award our 'Best EdApp' of the year awards for 2014," said Karen L. Mahon, Ed.D., President and Founder of Balefire Labs. "In 2014 we reviewed more than 2,000 educational apps according to our objective, science-based review criteria. The 18 apps that have won this award top our charts and do the best job of meeting those criteria. We hope that receiving this award will help these developers achieve greater recognition in the edtech space and with teachers and parents. We also hope this will lead to more kids successfully using these apps!" by Front Row by Front Row Education, Inc.: Ages 6-14 yrs. by G7 Research, LLC: Ages 8-18 yrs. by Odinix: Ages 6-10 yrs. by Lipa Learning s.r.o. : Ages 0-8 yrs. by Smithsonian Institution: Ages 7-8 yrs. by MindSnacks by MindSnacks: Ages 10-13 yrs. Unlike many other awards in the edtech marketplace, Balefire Labs does not require an entry fee for the "Best EdApp" award competition. Instead, every app that is reviewed at Balefire Labs is considered for the award. "We feel that requiring an entry fee is inconsistent with our values," says Mahon. "We think every app should have the opportunity to be recognized for its excellence, not just the ones created by developers who can afford an entry fee." 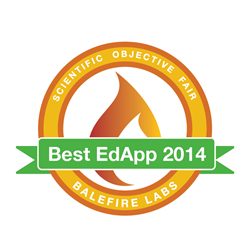 Developers of the winning apps will be offered Balefire Labs' "Best EdApp 2014" badge to use in their marketing efforts. Based in Tyngsborough, Mass., Balefire Labs, Inc. is a provider of tools and services that foster a child's learning & achievement. Launched in 2013, the online service provides parents and teachers objective evaluations on PreK-12 educational apps based on rigorous, scientifically-validated criteria, so they are confident they are choosing products that are most beneficial for their children. It is the only service available that uses objective criteria and makes its evaluation process transparent to parents and teachers so they have peace of mind. For more information about the apps that won this award please visit http://www.balefirelabs.com.